It had begun like a normal day, but when the charming Miss Wonderly appears in his office asking him to follow someone called Floyd Thursby. He lets his partner Miles Archer do this one and it seems straightforward. Turns out that it isn’t going to be easy when Thursby and Archer turn up dead shortly after and the police are there sniffing around for evidence. I am not normally a crime reader, finding a little predictable often. However, this classic private eye novel that spawned a 1000 imitations and I’d thought that I’d give it a go. The two main characters are strong and well supported by the minor characters. I really enjoyed the twists and turns that Hammett includes in the plot and the tensions that he builds in the narrative. A short and well-executed book. I *just* finished reading this one, and felt much the same – it was formulaic, but fun. 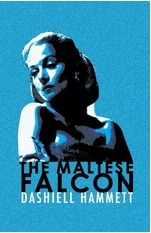 I was pleasantly surprised by the complexity of the female characters, given the era in which Hammett was writing; sure, they had to put up with all the usual pat-on-the-bum-“sure-sweetheart-get-us-a-coffee” BS, but they were layered and had agency, which puts The Maltese Falcon streets ahead of a lot of other noir work.